How might we empower students to visualize their learning artifacts and process in portfolios? 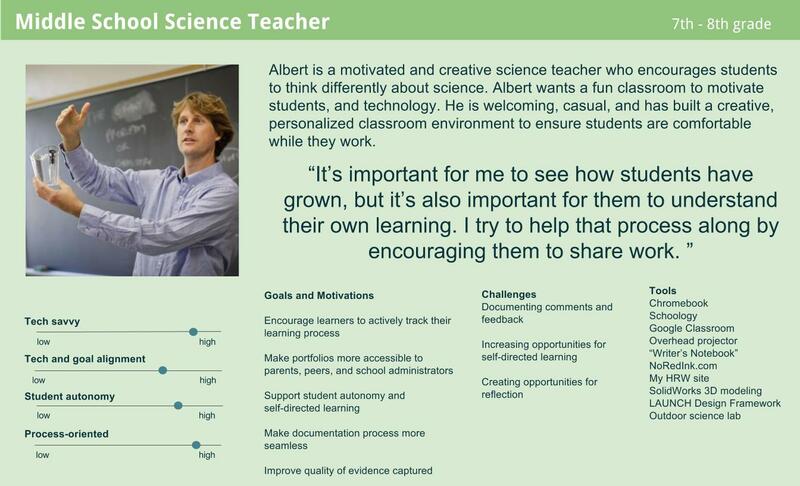 How might we help teachers support their students throughout the portfolio creation process? We worked with two middle-school teachers from a nearby school district. They taught technology/engineering and English, which challenged us to create a solution that could meet both of their needs and desires. a) concept video for the QVFolio app that students could use to capture, document, curate and present their projects; and that scaffolds in the app that could support the learning process. b) pocket-sized ‘prompt cards’ in the spirit of these cards from IDEO, which teachers can use when discussing strategies for supporting students, or reference when they see their students struggling. Here is a link to our cards. Please let me know if you can’t access them. After interviewing four people with exemplary portfolios, we gained an understanding of the end-to-end process of making a portfolio. From this, we created a model for portfolio creation. We interviewed our teacher-partners to learn about what they wanted. The technology teacher wanted to make his students’ learning visible through portfolios. He also wanted his students to use their documentation to share their work with each other and give each other constructive feedback. The English teacher aspired for her students to see their own growth through their portfolios. She had seen past students’ surprise when they saw how far they had come over the course of the year. 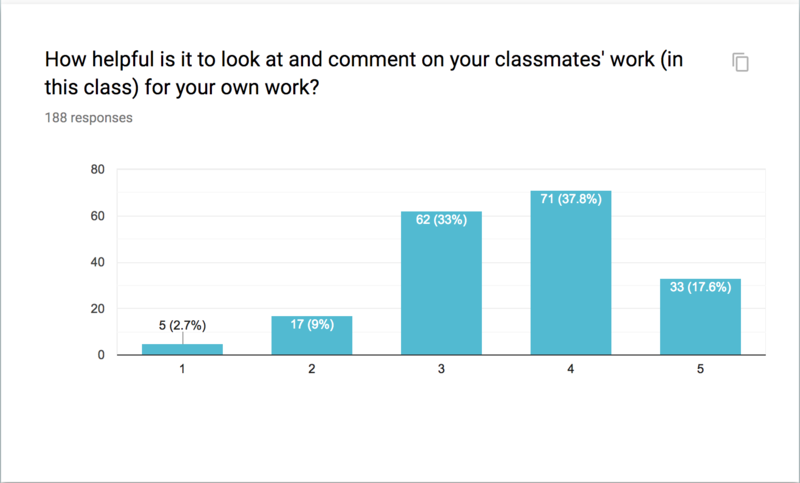 We sent out a survey to our teacher-partners’ students, and gathered 188 responses. 25% of students reported that they currently share their finished class projects with their families, while 34% wanted to do so. We used affinity diagramming to draw out themes, which we validated with our teacher-partners, and used to create a common persona (below), and an experience map that summed up our user research. Opportunities: Both teachers emphasize student choice over the topics they work on in their classrooms. Our solution will have to be flexible. Challenges: Both teachers use numerous technologies in their classes, and are weary of adding on to them. Our solution will need to be very user-friendly. Drawing on our research, we saw an opportunity to create something that would put students in the driver’s seat of the portfolio creation process. After writing HMW statements and brainstorming ideas, we saw that a combination of several fit our design principles the best. Below is one storyboard, read from top to bottom. The words in the upper right corner – capture, organize, curate, share and reflect – map to the stages of the portfolio creation process. Our first prototype was designed to help us better understand how students would capture, document and curate a project. We also wanted to see what challenged them and what helped, so we brainstormed ‘prompts’ like “Why don’t you try…” and brought graphic organizers like Flow Charts with us. Since we knew that our final design would be digital, we wanted to find the pain points of an online system. For the second user study, we had 6 English students tell a story in from their ELA classroom using google slides, their work, and a camera phone. Our collected findings and implications for the final design are below. QVFolio app: Our final design focused on three stages of portfolios: prepare, capture and organize. ‘Prepare’ refers to what teachers and students do before starting to work, like gathering materials. ‘Capture’ refers to collecting evidence, which is achieved through our QVFolio app that connects to a phone’s camera, which also asks students to reflect on their experiences right away. ‘Organize’ refers to putting together all their documentation for one project, and can also be done with the QVFolio app as well. From our user studies, we found that graphic organizers and prompts can be helpful, so we conceptualized that students can access graphic organizers, and teachers can push out announcements, examples and hints. pocket-sized ‘prompt cards’, color-coded for each of the stages. Teachers can use when discussing strategies for supporting students, or reference when they see their students struggling. Here is a link to our cards. Please let me know if you can’t access them.